The following document from the Essex County Court of Common Please shows a amount due to Daniel Hartwell from the ship's captain, Calvin Bunker..​Click on the image below to view the full document in a new window. 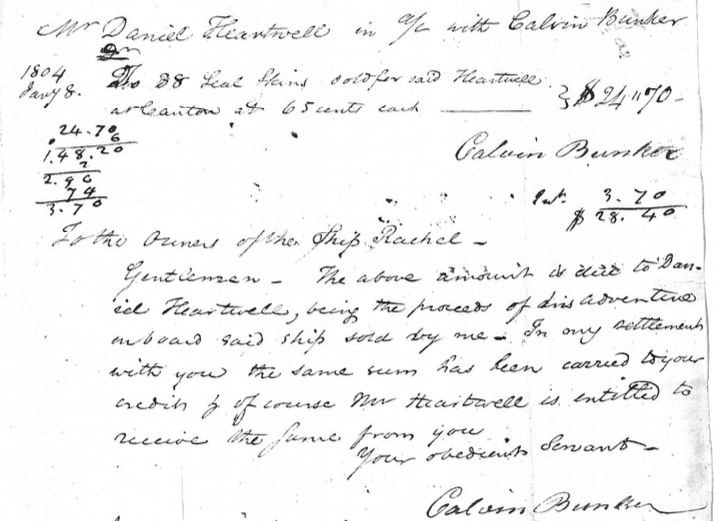 Gentlemen - The above amount is due to Daniel Hartwell, being the proceeds of his adventure aboard said ship sold by me. In any settlements with you the same sum has been carried to your ? of course. Mr. Hartwell is entitled to receive the same from you. By order of ? - J. Tucker, Clk.